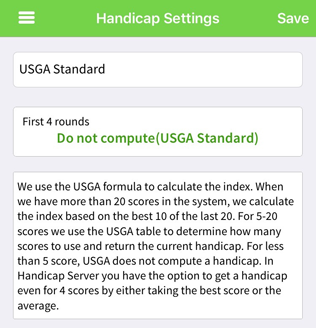 You can now use our Handicap Server iPhone app to enter scores if you don't have your computer or tablet around. 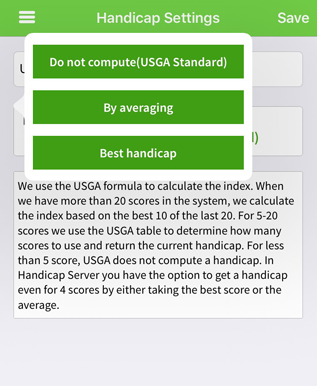 The handicap is updated automatically to reflect the new scores. 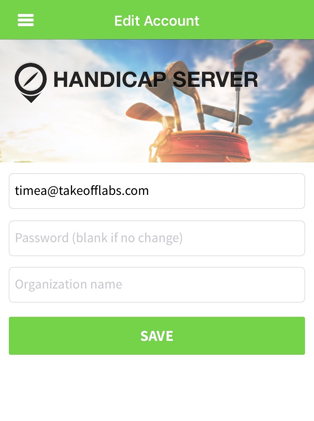 Handicap Server supports a large number of handicap methods such as the USGA Method, Rolling Average, Weighted Average and Advanced Handicaps. Read more about Handicap Methods. How to Sign In or Sign Up? In the case you already have an account on our Handicap Server website, you will only have to enter your email and password. 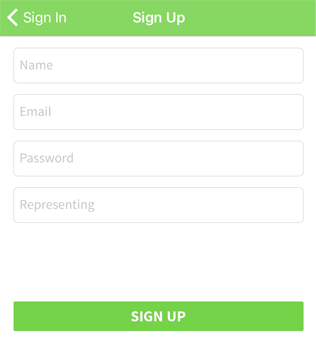 If you are a new customer and you don't have an account, you will have to tap Create an account. It will show up a new page, where you will have to fill the empty fields with the appropriate data. 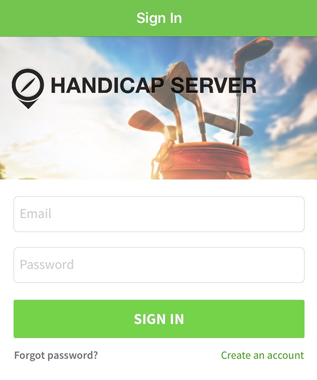 Handicap Server allows you to track your handicap or the handicap of a group of players. 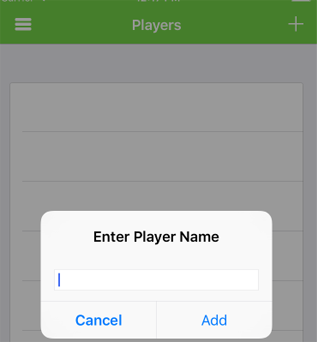 The first thing you need to do after creating an account is adding some players. It can be simply your name or the names of your ther golf buddies. After you have tapped the Add button, you will see a page where you can add your first score. To calculate a handicap, we need the some information about the course: a name, a tee, the rating and the slope. Also you should tell us if this is a 9 or an 18 hole course. Finally you can enter the total score and tap Add Score to save the information. Now that you have your first player, the Players list will look like in the following picture. 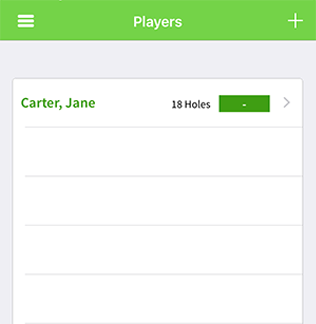 It is very important for you to know that we track the handicap of the first golfer for free. Tracking the handicap of additional golfers costs $2.99 per golfer per year. If you want to take a look at the scores or change something about a player, you just only have to tap on the golfer's name. 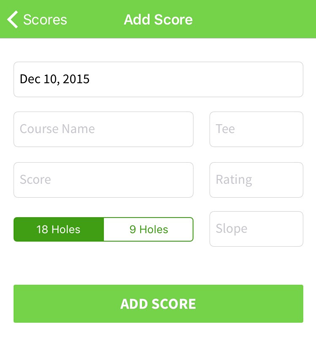 You can edit a score by tapping a score entry - tap on the row giving the score details (e.g., Winter Course...). On the left side of your screen you can find the Dashboard Menu. Here you can see four options: Players, Handicap Settings, Account Settings and Log Out. 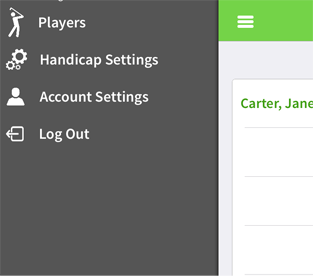 Handicap Settings allows you to peruse and read details about our various handicap methods. You can choose the desired method and input your own values if the method allows customization. 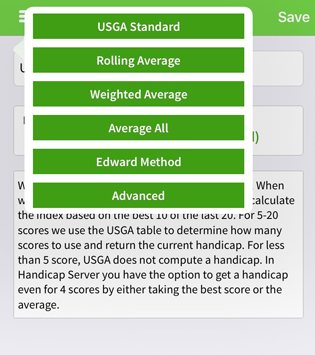 Tap on USGA Method above to see the full list of methods. IDo not forget to Save changes if you changed the computation method! By tapping on the second row you can choose how do you want to compute the Scores. Do not forget to Save changes! In order to edit your account you can tap Account Settings. Here you can change your password or add an organization name. That's pretty much it. Let us know if you found this article helpful or if you have any questions about our iPhone app. Happy golfing!